• The patent cleaning swab has extremely soft head, no damage to your sensor. • The head cover is made of super fine microfiber cloth which is soft to your sensor and hard to the dirt. • The width of swab is 16mm which is compatible to APS-C Frame sensors. • The powerful cleaning liquids are specially formulated for digital camera sensor cleaning. It is 100% non-toxic and non-alcoholic formula. It dries quickly. • The sensor cleaning liquids are stored in its unique designed leak-proof bottle to proof leakage during shipping. • Clean your camera at a bright and clean area. • Set camera to sensor clean mode (make sure your camera’s battery is fully charged, otherwise the function is greyed out). • Use professional VSGO air blower to blast the dust from sensor. • Remove the VSGO APS-C frame sensor cleaning swab form its vacuumed package and drip 1-2 drops of Cleaning Liquid on the head of the swab. • Gently drag the swab from the left of sensor to right. Turn the swap around and drag the clean side from right of sensor to the left. • Exit clean mode when cleaning finished. Turn off power and install lens. Keep camera in appropriative camera bag. 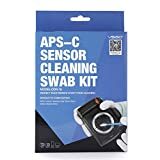 This entry was posted in Discount Photography and tagged 15ml, 16mm, APSC, Camera, CCD/CMOS, Cleaner, Cleaning, Digital, DSLR, Frame, Sensor, Swab, Swabs by Ball Photo. Bookmark the permalink.